But through it all, it is vital that the focus is kept on the overriding policy priority: allowing people a sufficient income in retirement for a decent standard of living in their later years. 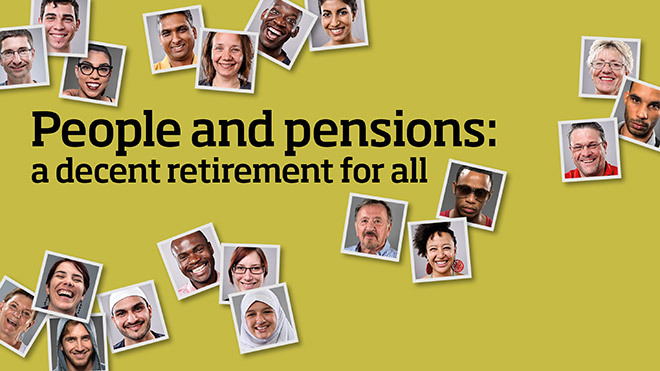 As part of the fight to ensure that the member is at the heart of pensions policy making, the TUC Pensions Conference being held in London on February 1 is entitled People and pensions: a decent retirement for all. The free event is aimed at pension trustees, trade unionists and all interested in a trade union perspective on pensions. There will be a review of automatic enrolment into workplace pensions. We will also receive the results of the Independent review of state pension age; and we will learn if the governremnt intends to change state pension age for those leaving the workforce after 2028. And the financial regulator is looking at long overdue reforms to improve transparency in asset management which should help pension schemes to keep a lid on costs and achieve better deals for members. The TUC Pensions Conference is a rare opportunity to discuss all of these aspects in the same day with many of the key figures in the debate. This free event will features contributions from senior figures including Pensions Minister Richard Harrington; John Cridland, the Independent reviewer of state pension age; Debbie Abrahams, the Shadow Secretary of State for Work and Pensions; and John Kay, the economist who has spearheaded attempts to reform the lengthy investment chain. There will be discussions on where the gaps are in automatic enrolment into workplace pensions; whether DB pensions have a long-term future; and what the future holds for the state pension. Delegates will also get insights into member decision making before and at retirement from experts in the field.